At Raven, we are dedicated to innovation — continuously improving our products and processes. 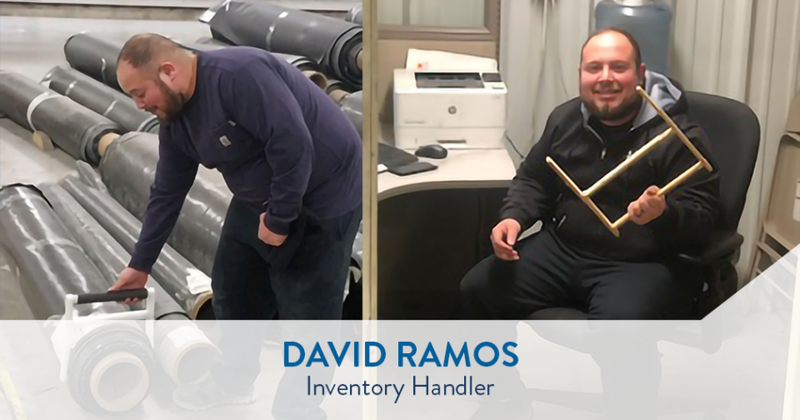 David Ramos, Raven Engineered Films Inventory Handler, noticed an inconsistency in our quality inspection processes and developed a new tool to cut down on measuring time. This tool is now widely used at our Midland facility. Congratulations, David, for being named April's Team Member Spotlight winner! In the inventory handling process, David noticed an inconsistency in rolls that were being sent to the reclaim center. The rule states that every roll 10 inches or more in diameter is to be scrapped. However, given the fast-paced nature of the job, taking a tape measure out to check each roll gets too cumbersome. Now, instead of estimating or having to use a measuring tape to determine whether or not a roll of film needs to be scrapped, the Midland plant is equipped with David’s new invention — the “Scrap Gauge Tool.” This tool provides the inventory handlers with a quick and easy way to ensure that the rolls are up to specification. This not only reduces human error in guessing and measurement — it reduces reclaim costs and ensures that we are selling as much quality material as we can. For these reasons, the tool will be housed in each pit and scrap area at the Midland plant. Thank you, David, for fulfilling a need in our processes, increasing quality and efficiency in handling inventory!